Before they jointly discuss the potential deferment of major capital projects — to free up funding for higher priorities — the Sarasota County commissioners have decided they first will talk one-on-one with county staff to seek any extra information they need and offer suggestions. Among the possibilities staff has proposed as a way to help cover the cost of the top priorities the commissioners have identified are delaying the extension of more sewer lines as part of the Phillippi Creek Septic System Regional Program and putting off spoil island restoration work. Based on the one-on-one discussions with the commissioners, Chief County Engineer Isaac Brownman said, staff will be prepared at the board’s next budget workshop — on March 29 — to offer better ideas about how to pay for the new courtrooms and renovations at the R.L. 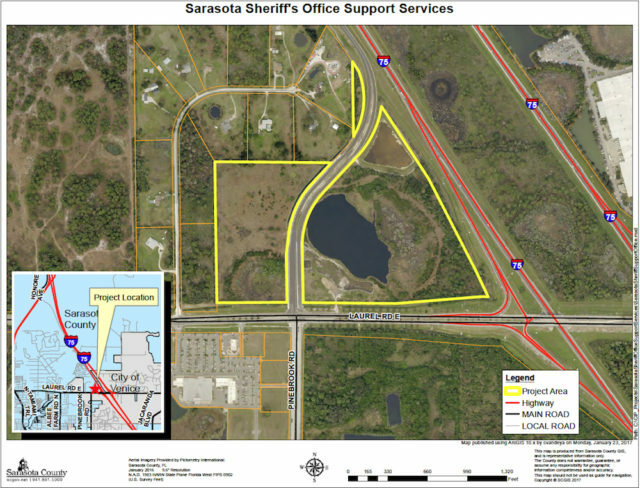 Anderson Administration Center in Venice; the Sheriff’s Office Fleet Maintenance Facility on Laurel Road; a new Central Energy Plant in downtown Sarasota; and the North Extension of The Legacy Trail. In the meantime, the commissioners did vote unanimously on Feb. 17 to approve a staff recommendation for borrowing the funds to pay about $16.5 million for a Cattleridge Road building for use by the Sheriff’s Office; it will take the place of two county-owned and two county-leased facilities. The annual debt payment is projected at $1.1 million over the 30-year term of the bond. However, Detert again voiced concerns — as she had when the board first addressed the proposal on Feb. 7. Because Sheriff Tom Knight’s budget is the largest annual draw on the county’s General Fund, she told County Administrator Tom Harmer, she wanted to see details about how Knight and his staff are working to save the county money through the move to Cattleridge. Detert noted that the resolution the board approved on Feb. 17 called for the county to spend $3,115,280 on improvements to the structure, in addition to purchasing it. Part of the extra expense will cover new information technology infrastructure necessary to connect the building to Sarasota County’s network, a staff document noted. Deputy County Administrator Steve Botelho — who also serves as the county’s chief financial management officer — told Detert that Knight and his staff will present their 2018 fiscal year budget to the board in June. In the meantime, Botelho said, they are working on “providing a full analysis” of the cost savings they anticipate, especially by enabling the county to terminate two leases. The relocation of staff to the Cattleridge building is expected in late summer, Brownman told the board. The three-story, 71,592-square-foot property at 6010 Cattleridge Blvd. 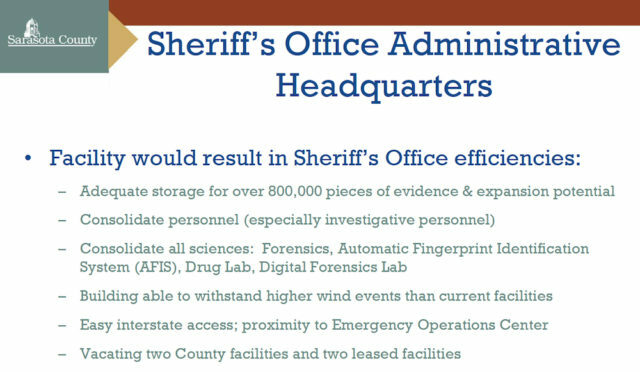 not only will serve as the new administrative headquarters for the Sheriff’s Office, but it also will comprise storage for more than 800,000 pieces of evidence and consolidate all the Sheriff’s Office science divisions — such as Forensics and the Automatic Fingerprint Identification System, Brownman noted. Kaitlyn Perez, community affairs director for the Sheriff’s Office, told The Sarasota News Leader this week that the current plan calls for just those employees assigned to quartermaster and records responsibilities to remain in the Sheriff’s Office facilities on Ringling Boulevard in downtown Sarasota. However, some of the department’s Civil section workers might remain there, as well, she added. As part of the board’s Feb. 17 vote on the Cattleridge building, it also agreed to the design work for the new single-story courthouse structure on the R.L. 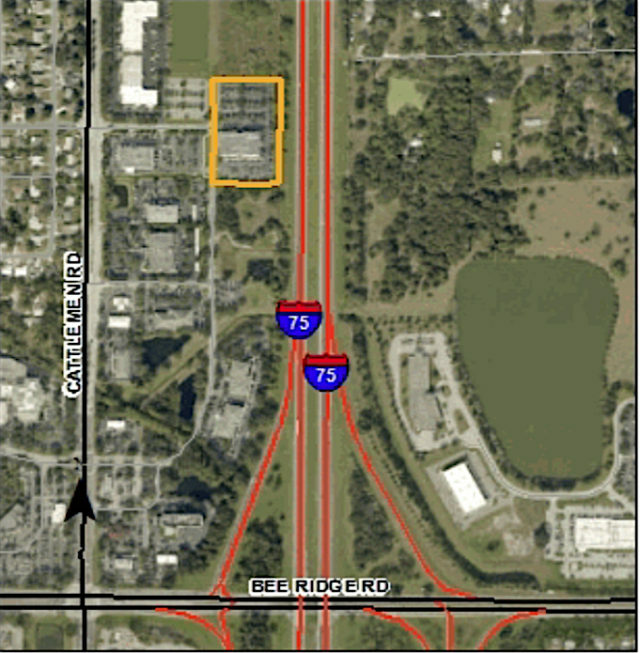 Anderson Administration Center campus in Venice, as well as renovations to the Anderson Center to support court services; plus the design of the new Sheriff’s Office Fleet Maintenance Facility on Laurel Road near Interstate 75 in Nokomis. Impact fees will cover the expense of the design work for both the Anderson campus and the fleet facility, Brownman added. The funding for that aspect of the Fleet Maintenance Facility project was put at $1,825,337. The design is expected to be completed in the summer of 2018, Brownman said. 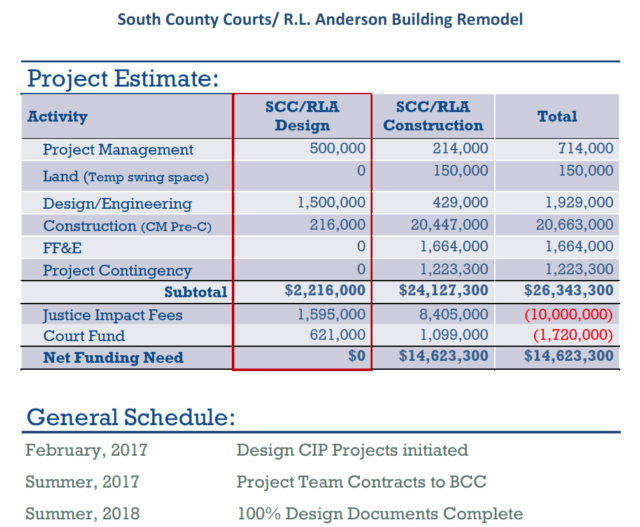 Design work for the Anderson Center and the approximately 28,700-square-foot South County Courts building was estimated at $2,216,000. It also is projected to be finished in the summer of 2018. 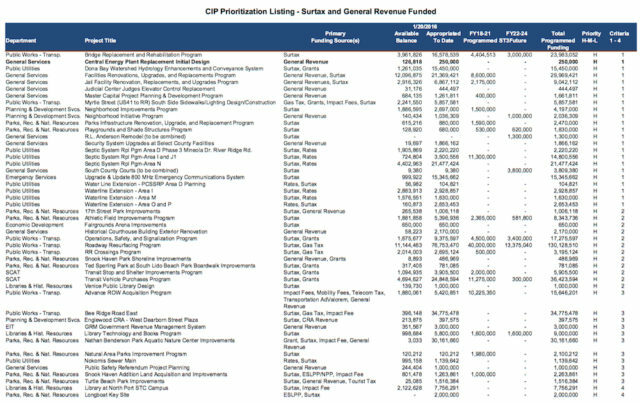 During his Capital Improvement Program (CIP) presentation, Brownman pointed out that of the $1,155,524,762 budgeted for fiscal years 2017 through 2021, $640.5 million has been spent or committed to projects; another $263.5 million has been allocated through FY17, which ends on Sept. 30; and $251.6 million has been allocated for Fiscal Years 2018 through 2021. 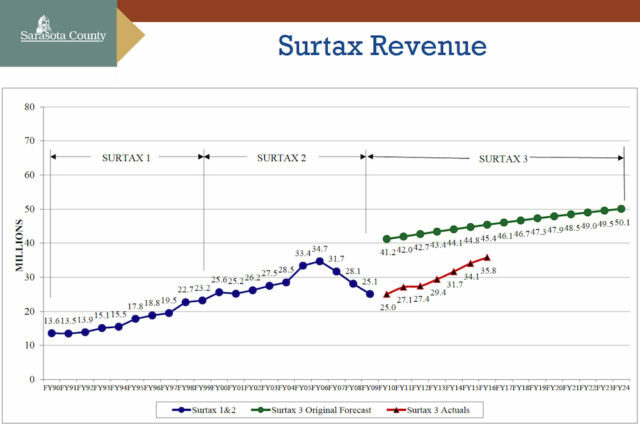 Funds from the Surtax 3 local option sales tax approved by voters in November 2007 are supposed to cover 26% of the expense of CIP projects through the 2021 fiscal year. The levy of the tax began in September 2009 and will continue through Dec. 31, 2024, a county historical document explains. Staff works each year to “maximize the use of available funding” to pay for projects that are the board’s top priorities, Brown told the board. Additionally, project rankings are created on the basis of four criteria, he said: health/safety/welfare of the general public; the need for maintenance and replacement of existing structures; expansion of existing programs; and projects that would allow for new programs and services. Altogether, Brownman continued, staff has a list of 293 projects involving 11 county departments. 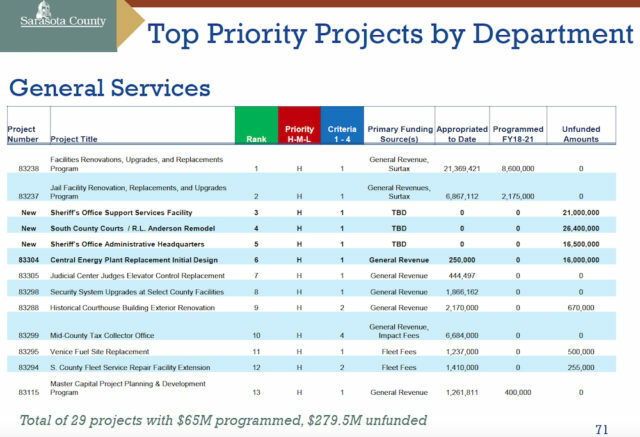 As an example of how the staff uses a matrix to end up with a project ranking, Brownman showed the board the list of priorities for the county’s General Services Department. The top six projects are Facilities Renovations, Upgrades, and Replacements Program; Jail Facility Renovation, Replacements, and Upgrades Program; the Sheriff’s Office Fleet Maintenance Facility; the South Courts/R.L. Anderson Center remodeling; the Sheriff’s Office Administrative Headquarters; and the Central Energy Plant Replacement Initial Design. To pay for the 29 projects, he noted, 71% of the money would come from the General Fund, 14% out of revenue from the voter-approved surtax; 5% from impact fees; and the remainder from a combination of other sources. On the other hand, he said, $8.4 million could be saved by delaying the next projects in the Phillippi Creek Septic System Regional Program, and $2.3 million could be taken from the spoil islands restoration initiative. The latter was planned to restore degraded coastal habitat, provide additional recreational activities for the public in terms of fishing and boating opportunities, create improved habitats for fisheries and wildlife, and create “important amenities for commercial and ectotourism benefit,” according to an April 27, 2016 budget workshop presentation. When Commissioner Alan Maio asked whether residents in the areas proposed for the next phases of the Phillippi Creek project already had been notified of the pending work, Brownman said he was not certain. County Administrator Harmer promised to check with staff on that. “We do because of the rate of accidents that have been happening at that intersection,” Brownman replied. Commissioner Charles Hines suggested the board may be able to delay the construction of more athletic fields in the near term. “We’ve done a lot in the last two or three years. He also asked for more details on the roadways linked to the $10.2 million set aside for right of way acquisition. As for the spoil islands: “To me,” Hines said, “that’s a simple no-brainer. I’ve never seen even one email or complaint from a citizen,” regarding any of them, he added, except Snake Island, whose restoration the West Coast Inland Navigation District oversaw.